The McBurney Transport Group has recently introduced Freeway asset management software, which is now managing over 1,400 live McBurney assets, consisting of a fleet of 1,400 vehicles and trailers. The software is use for scheduling over 6,000 annual service checks, and the company’s 20 HGV mechanics and trailer fitters at Ballymena and Liverpool are also using the Freeway mobile application for defect recording and for completing inspections. The McBurney Freeway system has been configured to integrate with the company’s existing IT infrastructure, including its transport planning system, vehicle walk-around check application and accounts package. According to Sammy Hamill, McBurney’s Fleet Manager, the company initially began researching IT systems that could automate its repair and maintenance process, but through evaluating the options available, discovered that Freeway could offer significant added value with additional product features, countless integrations and a high level of customisation. He explained: “As part of the evaluation process we visited another existing Freeway user to see the system working in a live environment. This gave us the confidence to proceed with the Freeway installation because we realised how tailored it could be to our specific requirements. The visibility over asset costs and stock control, as well as simplified external and internal invoicing procedures, were additional benefits that we could see being extremely beneficial from the outset”. The Freeway system is now managing over 1,400 live McBurney Transport Group’s assets, including trucks, trailers, vans and shunters, with extensive vehicle information available for analysis and reporting. Details available include everything from purchase date and horsepower to tyre size and emissions levels and even the asset’s depreciation schedule. In addition, McBurney Transport Group is now scheduling its 6,000+ annual service checks using Freeway, including truck and trailer OLIs, MOTs, oil changes, tachograph calibrations and fridge motor inspections. The system has also been introduced to 20 HGV mechanics and trailer fitters across the company’s two maintenance facilities in Ballymena and Liverpool, all of whom are using the Freeway mobile application for defect recording and for completing inspections. Raymond Burns, Workshop Manager at McBurney’s Liverpool depot added: “I am well known for having very particular processes and controls, so I was initially apprehensive about Freeway. During the implementation, a bespoke schemefor components was designed for the McBurney Transport group’s operation to facilitate the coding and import of over 4,000 parts in the company’s combined impress and owned inventory stock. Thanks to its integration with the company’s existing IT infrastructure, planners are now notified of critical defects and service items that are due or overdue, fitters are automatically notified of defects and job cards automatically generated for rectification work, and all purchase orders, maintenance sales invoices and stock level adjustments are pushed into the company’s accounts package. Finance Director Pamela McCrea commented: “We are really pleased with how the system is working so far. We have found it to be a cost-effective solution and it is surprisingly easy to use, even for those that aren’t particularly experienced in using technology. The backup from both Freeway and Genie Insights has been first-class throughout”. Matt Reeve, Director at Genie Insights added: “Freeway is not an ‘off-the-shelf’ system and is designed and implemented around the customers’ requirements, internal terminology and unique operational processes. Using the large and complex McBurney group operation we have been able to demonstrate just how versatile and bespoke Freeway can be. 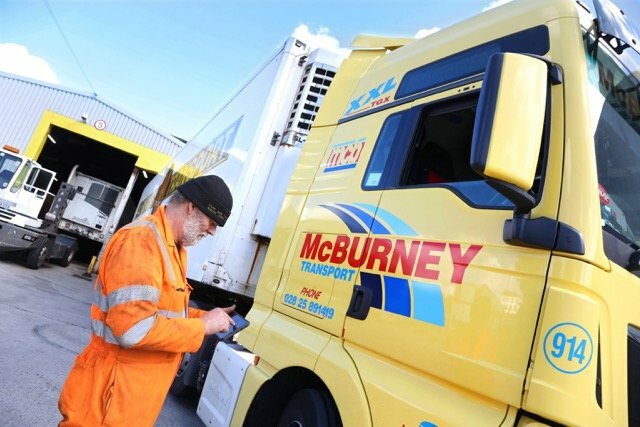 All McBurney Transport group’s users across all sites have embraced the new procedures and I have witnessed first-hand the development of strong industry best practices”. Genie Insights is working with many prominent operators throughout Ireland on implementing Freeway, including McBurneys, Agro Merchants, McCulla Ireland and many others.